If you go down to the Nellie Dean pub in Soho today you’re sure for a big surprise, should you be the sort of person who is surprised by novelty movie advertising. 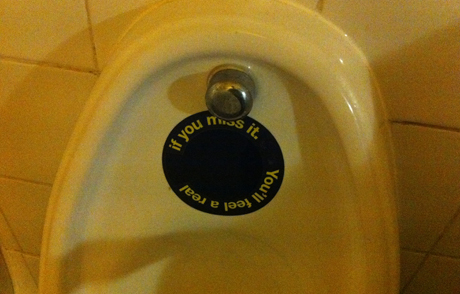 It would appear that some poor ‘street team’ fucker has gone around laboriously (and unhygienically) putting circular black stickers with ‘if you miss it, you’ll feel a real’ written on them on all the urinals. The fabulous twist? The application of urine (or any other liquid, presumably) reveals the Jackass 3D logo on the centre of the sticker, proving that all those mirror-based ads for the Kiefer Sutherland movie Mirrors weren’t *quite* the worst piece of bathroom-centric publicity we’d see this century. This sort of business simply cannot be good for the world.